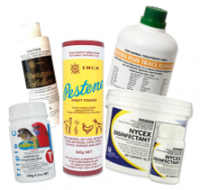 Health products for poultry, chooks,ducks, turkey’s quail, game, pigeons and other birds. Long standing products such as vitamins, wormers, coccidiossis treatment, non-prescribed medicines such as broad spectrum antibiotics, probiotics, apple cider vinegar (with mother), peck blocks and pigeon PMV vaccine. We also stock vaccinators for various dosages. It is important to note that as we have moved back to birds in open range the contact of small scale poultry with wild birds has increased and so the possibility of parasite movement increased. If simple control measures do not work, and the birds are infested so frequent treatment is needed, then you should consider whether there is another underlying health problem in the flock, or a high level of transmission from wild birds. Pestene powder is produced from Derris dust (made from rotentone roots and sulphur). Regarded as a natural pesticide, it is effective against lice and mites on the birds, but is not good against red mite which live off the bird. Pestene comes in an easy to use sprinkle 500g gram can. Absorbacide® (or diatomaceous earth (DE)) is made up of micro fine, microscopic freshwater diatoms, with the unique capacity to damage red mite and similar exoskeleton nasties. Effective in dry locations where the red mite will come into physical contact with it, i.e. sprinkle on the perches, nest boxes, cracks and crevices where the red mite hide. The diatoms scratch and cause abrasion to the exoskeleton of the red mite, causing body fluid to be exposed to the unique absorbing action of the Absorbacide®. This cause the red mite to dehydrate and die. It works this way with all sub millimetre exoskeleton parasites, and with the juvenile stages of some larger parasites. Normal use a dessert spoon of Absorbacide® in each nest, and in dust bathing areas, along perches, and in cracks and crevices. Use a dust mask and gloves and avoid inhalation of the Absorbacide. Avian Insect Liquidator (AIL) is for use on show poultry only (not for food producing birds i.e. layers, broilers). Finely spray birds and environment such as nests and perches, to control a wide range of insects found on birds. This is insect spray has some residual activity. It has a unique two way approach to parasitic control as it kills lice (Permethrin) and inhibits insect egg hatching and juveniles maturing (Methoprene). Avitrol Lice and Mite spray is for use on show poultry only (not for food producing or small birds i.e. canaries or finches). It has little residual activity. Spread by the ingesting infected faeces. Roundworms present in small intestine are 5 to 8cm long. Large roundworms occur when litter or runs have been used for many years. Poor growth, diarrhoea, loss of activity, possible for worm to crawl into oviduct and inside eggs (extreme case). Piperazine is approved for poultry worms. Organic food grade diatomaceous earth known as Molodri can be used, 2-5% in dry feed continually and very effective. 7-18 mm long, about 0.05 mm wide and hair-like in appearance. Earthworms can be a host, spread by ingesting infected faeces. Avitrol tablets are effective against gape worm. Organic food grade diatomaceous earth known as Molodri can be used, 2-5% in dry feed continually and very effective. Found in digestive tract of hens and many animals. They can make hooks and suckers to attach themselves to the lining of the gut. Some species can grow up to several meters in length. Spread by infected faeces and secondary hosts like flies, ants and snails. Malnutrition occurs, poor growth, sometimes without symptoms. Infecting the trachea’s of hens. Worms clog and obstruct the airway. Adults travel through the lungs causing a severe pneumonia. Eggs found in the faeces. Can spread by eating infected slugs, snails, earthworms. Hens “gape” or open their mouth while stretching their necks over and over. Avitrol tablets are effective against gape worm. Organic food grade diatomaceous earth known as Molodri can be used, 2-5% in dry feed continually.